To prepare the prawns, pull off the head and peel away the shell, leaving the tail intact. Use a small, sharp knife to run down the back of the prawns and pull out the black intestinal tracts, if visible. Then use the knife to cut almost all the way through the prawns and butterfly them open. Flatten them out a little with the palm of your hand. Pat dry with kitchen towel. For the batter, mix the flours and salt together, whisk in the egg and enough of the water to give a smooth batter the consistency of single cream. Heat the ghee in a heavy-based saucepan or karahi over a medium heat. 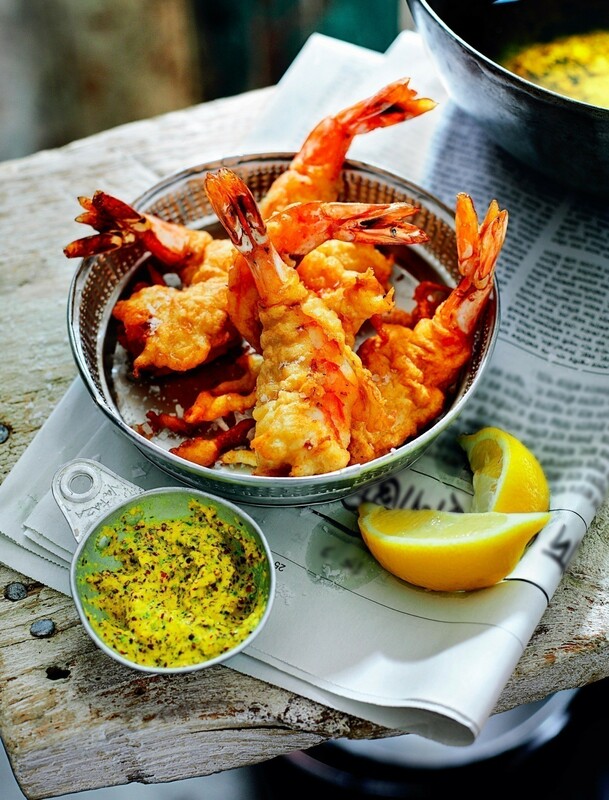 Once hot, dip 2 or 3 prawns in the batter and carefully lower into the ghee. Fry for 2–3 minutes, turning once, until crisp and golden and cooked through. Drain on kitchen paper. Repeat with the remaining prawns. Serve with lemon wedges to squeeze over and chutney and kachumber salad on the side.